This is so gorgeous! I ordered the red one, which is really a light red (because it is weaved with white as well), like a dark pink, just as it is shown in the pictures. The cotton is so soft. It is high quality. I love it so much. I am going to order a blue one, because it's so pretty. I will be using this at the beach and it is so lightweight compared to a regular beach towel; I'm really looking forward to using it that way. It's also pretty enough to use as a throw on the couch or the bed. I am so pleased with this purchase. I am even considering buying more as gifts. Crafted of Turkish cotton, this Emma jacquard double weave pestemal fouta beach towel is soft and absorbent. 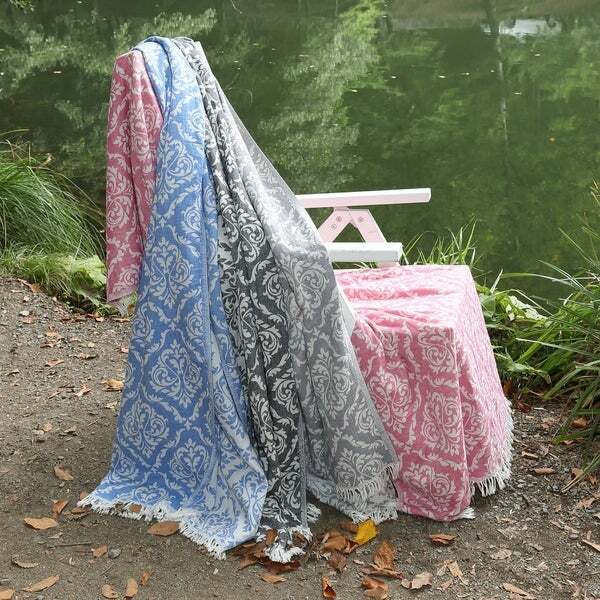 Featuring decorative fringe on two edges, this large towel comes in a choice of 4 colors with a beautiful damask design. The pestemal dries quickly, is extremely durable and fits into your beach bag or suitcase with ease. The versatile pestemal can be used as a towel, family beach blanket, sarong, shawl, fun table cloth, bed topper, beach chair cover or a throw on your sofa. The Emma pestemal beach towel is produced in a state-of-the-art vertically integrated green factory in Turkey, which runs on 100-percent solar energy. This looks great, and works fine as a travel blanket/sarong/coverup. But as a towel, it isn't as absorbent as other fouta towels I have. I chose it for the color and pattern, but Overstock has others that look fine and work better.